What's killing the trees? The balsam woolly adelgid (Adelges piceae) is an insect pest that infests and kills stands of Fraser fir (Abies fraseri) in the spruce-fir zone. 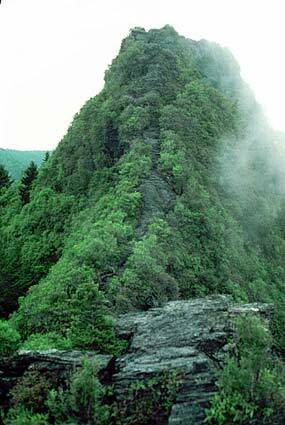 This fir occurs naturally only in the southern Appalachians and used to be the dominant tree at the highest elevations. The adelgid was introduced on trees imported from Europe, and the fir has little natural defense against it. By injecting the tree with toxins, the adelgid blocks the path of nutrients through the tree. The trees literally starve to death, and thousands of dead snags are all that are left on the highest mountain peaks. There are several trails that start on Clingmans Dome Road and parking area. The Appalachian Trail (AT) crosses Clingmans Dome, marking the highest point along its journey from Georgia to Maine. Cool, wet conditions on Clingmans Dome's summit make the spruce-fir forest that grows there a coniferous rainforest. Catch a breathtaking sunrise or sunset from the tower or enjoy the 360º panoramic vistas during the day. At an elevation of 5,048 feet, Newfound Gap is the lowest drivable pass through the Great Smoky Mountains National Park. Newfound Gap's recognition as the lowest pass through the Great Smoky Mountains did not come until 1872. Arnold Henry Guyot, a Swiss geographer, measured many Southern Appalachian elevations. Mt. 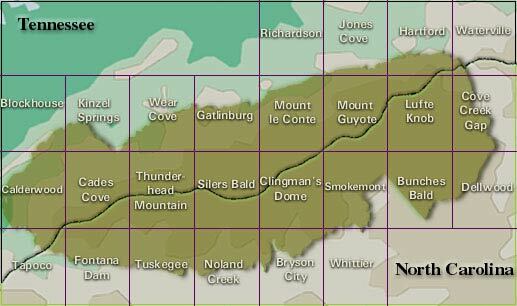 Guyot, the second highest peak in the Smokies, takes his name. He used a simple barometer to measure changes in air pressure to calculate mountain heights. In most cases he was within 2-3 percent of current values. His work revealed Newfound Gap as the lowest pass through the mountains, displacing nearby Indian Gap. A new road followed, and it became the forerunner of Newfound Gap Road. Rockefeller Memorial honors a $5 million donation from the Rockefeller Foundation to help complete land acquisitions to bring about the creation of the Great Smoky Mountains National Park. Scenic views from the large parking area. The Appalachian Trail (AT) crosses over Newfound Gap Road and straddles the state line between North Carolina and Tennessee for most of its length through the park. Visitors can enjoy a short stroll to stretch their legs or a multi-day backpacking excursion on the AT as it runs through the park. Make no mistake, they are legion: from Anne Royall, America's first female muckraker, to Sequoyah, a Cherokee mountaineer who invented the first syllabary in modern times, and international divas Nina Simone and Bessie Smith, as well as writers Cormac McCarthy, Edward Abbey, and Nobel Laureate Pearl S. Buck, Appalachia has contributed mightily to American culture — and politics. Not only did eastern Tennessee boast the country's first antislavery newspaper, Appalachians also established the first District of Washington as a bold counterpoint to British rule. With humor, intelligence, and clarity, Jeff Biggers reminds us how Appalachians have defined and shaped the United States we know today. The author is completely absent from the text. The lucid style will please readers who want the facts, not editorial comment. This book, as well as the others in this publisher's backroads series, makes an excellent gift for anyone, especially the many seniors who have relocated, or are considering relocating to this fascinating region. It is also a valuable reference for natives, like me, who didn't know how much they didn't know. Recommended Reading: Touring the East Tennessee Backroads (Touring the Backroads) (380 pages) (John F Blair Pub; 2 edition) (October 1, 2007). Description: The historical facts in the first edition of Touring the East Tennessee Backroads have not changed much since the book was first published in 1993, but highway construction and development has altered the routes of the 13 tours. For this second edition, the author drove over 3,000 miles to update the tours where people such as Daniel Boone, Davy Crockett, Sam Houston, Andrew Jackson, Sequoyah, Nancy Ward, and Clarence Darrow once traveled the same backroads. Using his numerous journals, he wrote of first-hand observations of the mountains and people during his 10 years of travels through the Appalachians. 6x9 trade paper, 548 pages. Includes foreword by Ralph Roberts. He depicts the evolution of a backwoods farm-and-forest society, its divided and unhappy fate during the Civil War, and the emergence of a new industrial order as railroads, towns, and extractive industries penetrated deeper and deeper into the mountains. Finally, he considers Appalachia's fate in the twentieth century, when it became the first American region to suffer widespread deindustrialization, and examines the partial renewal created by federal intervention and a small but significant wave of in-migration. Throughout the book, a wide range of Appalachian voices enlivens the analysis and reminds us of the importance of storytelling in the ways the people of Appalachia define themselves and their region.